The 6.7L diesel engine is used in the Ford F250 4×4 truck. It is one of the biggest blocks available for regular sized automobiles. Since the 7.3-liter is no longer available, people have turned to the next best thing. Ford Motor Company built its own block and quality matters. To buy a Ford F250 diesel engine for sale, use our easy ordering system at DPF. In its stock formation, a Garrett turbocharger is installed on the 409 CID block. In the year 2011, the first launch of the F250 with the Powerstroke was completed. The horsepower was clocked at 330. In later years, this power level was upped to 440 hp. Depending on when the build was created, the actual performance can vary for a used edition. The block is made from iron. Its actual alloy is called graphite iron. It is very strong and can handle high temperatures. A 6-speed Torqshift transmission is the factory installation with all new F-Series pickup trucks. Because of the size, a 5-speed would not have been appropriate. Buying on the secondary market comes with some insecurities. How many miles are on it? Will it break down? These are conversations people can have with a dealer rep or even with themselves. Websites that let anyone sell inventory are part of the problem. There are no checks and balances nationally when used auto parts are retailed. It is buyer beware. The 6.7 Powerstroke for sale at GotDieselEngines.com is a good buy. Not because we think we have the best price. It is because we know it runs well. Thorough tests are in our list of things to do for our inventory. There is nothing worse than motors that do not start once they are dropped under the hood. Any sale here already includes the terms of coverage in a warranty. This means factory parts. It also covers a portion of the labor should a defect happen. It is expensive to ship us back a block. We would rather pay the mechanic expensive for a change out if we need to. This rarely happens, but we offer it in our coverage policies. 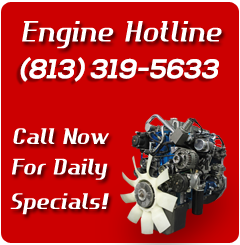 We deal with Ford, Chevy, Dodge, Duramax, Cummins and a bunch of other brands. It is our 6.7-liter that has become a best seller. Get get deals on these when we buy. It is only fair to do the same for the public. Choosing the sale price in our parts finder computer is needed before you can order. Go ahead and try it out. Then call us to complete the sale.